19 years this summer. That’s how long we’ve lived in this house. Three times as long as I’ve ever lived anywhere else. Some days it feels like I never have lived anywhere else. Until I take a new turn off a familiar street and discover a road in my own town that I’ve never seen before. That’s interesting. Maybe they just put that road in? Well, it’s nice that this old place can still surprise me. I gripe about the unimportant things that annoy me about living here, but my list is pretty short: the cold winters, the dearth of decent restaurants, the frost heaves in the road that sort of never go away, the bicyclists who can’t seem to ride single file, the lack of places to shop for basic housewares, like sheets and pillows. But, really, my only significant complaint is that we can’t get a pizza delivered to our house. Mostly, I love living here, in the house of my childhood fantasies, posts and beams and creaky floorboards and all. The comforting hills, the foggy morning river valleys, the piercing peeper chorus, the star-strewn nights. I love that I drove all over Vermont today, on my way to pick up a used mini refrigerator where we can store milk for making cheese, and I looked hard for some graffiti that I could photograph, and you know what I found? Not much. Sets of initials on bridges, summed together with heart operators. A sketch of a funny face on a highway overpass. The word “Respect” on the side of a building. 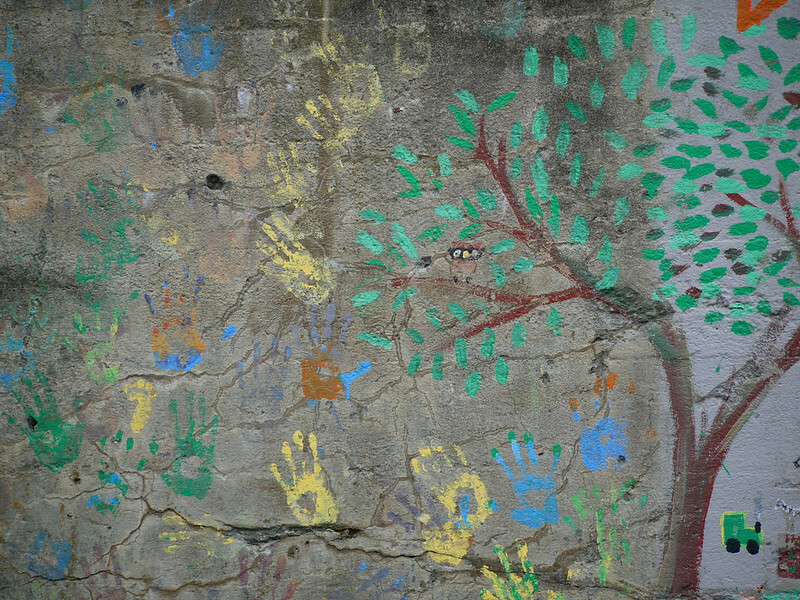 And a mural entitled “Community,” painted on the side of a rough, cement wall that buttresses a railroad bridge. At the bottom of the mural, the river is painted wide, bright blue, the foundation of everything else. Above it are the mountains, a pair of hot-air balloons, a rainbow, a sun rising above puffy clouds, a leafy tree with a little owl in its branches, and hand prints, in all colors and sizes, some perched on branches like birds, some taking flight on a perpetual summer day. It’s an idyllic image of a place that doesn’t really exist. Except when it does, briefly, out of the corner of your eye, when you can’t feel the difference between your body’s temperature and the air’s temperature, and you and the day are one perfect thing. I love this….seems almost primitive.